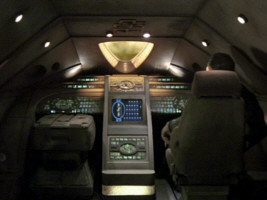 A new shuttle interior was built for the streamlined "Warp 10" shuttle Cochrane to appear in VOY: "Threshold". The shuttle and the cockpit set showed up several more times as a Type-9 (or "Class 2") standard shuttle, although initially the impression was created that the Cochrane was a one-off design. 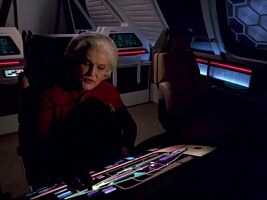 The set was then redressed a couple of times for various Federation and alien shuttles. 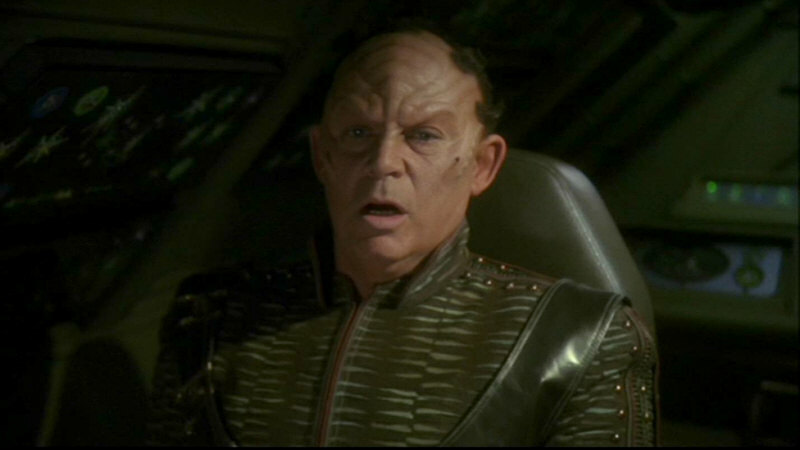 Type 9 model in VOY: "Threshold"
Type 9 interior in VOY: "Threshold"
In this article we investigate the various redresses of the shuttle interior, and we try to find possible rationales for some of the changes. 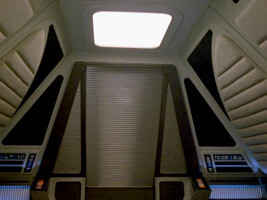 The interior of the shuttle corresponds to the very streamlined outside appearance. Especially the windshield slope of this design is extremely shallow. Furthermore the side walls with the long lateral windows slope up in a rather shallow angle of roughly 45 degrees. This leaves rather little clearance for people standing inside. 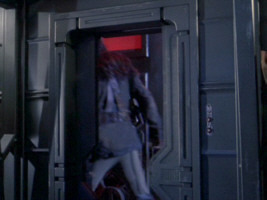 Finally, there is a characteristic hatch at the aft end that is visible also from inside. 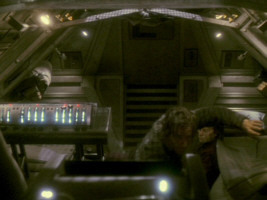 Type 9 interior in VOY: "The Swarm"
Type 9 interior in VOY: "Future's End, Part II"
Type 9 interior in VOY: "Fury"
Type 9 interior in VOY: "Latent Image"
The cockpit of the Federation scout hijacked by Data in "Star Trek: Insurrection" is a redress of the interior of the Type-9 shuttle from Voyager. 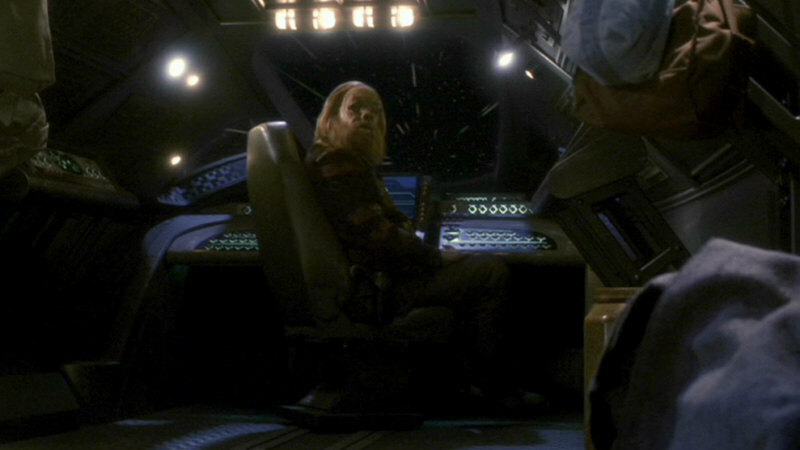 The two seats were replaced with a single seat, and the aft end of the set was modified to allow Worf to enter from the docking hatch. Also, a wall with an octagonal opening was inserted between the seat and the aft compartment. 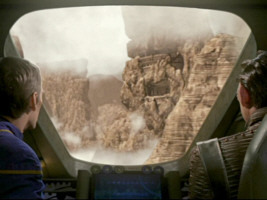 The scene filmed for "Insurrection" largely avoids to show the ceiling of the set and the characteristic windshield that does not quite match the exterior of the scout. 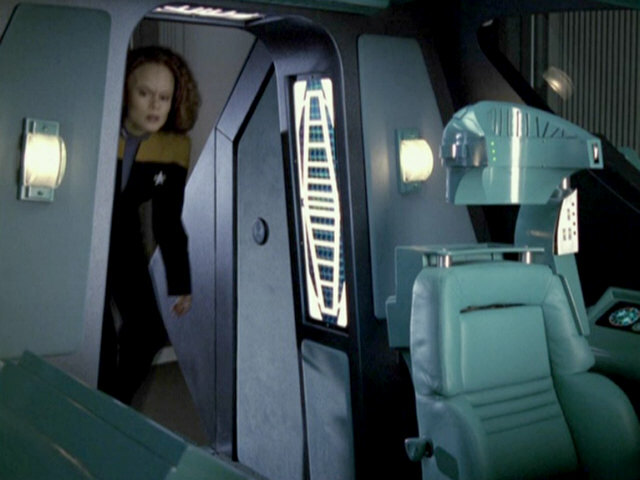 Scout interior in "Star Trek: Insurrection"
However, we get a glimpse of the front window at one point, revealing it is indeed the same as that of Type 9. The controls are still the same as well. 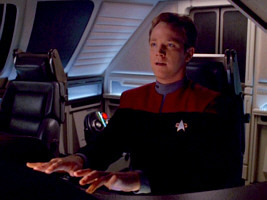 Naturally the Type-9 cockpit set was also re-used for Janeway's similarly shaped shuttle SC-4 in VOY: "Endgame". For this version, extensive modifications to the consoles were made that would persist throughout some later appearances. 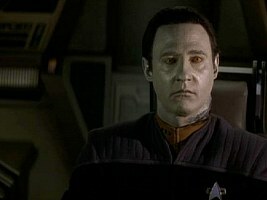 The changes most obviously concern the central "console column". 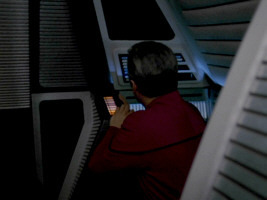 This part protrudes further on the top and does not have two illuminated consoles above the monitor any longer but only one somewhat taller console. 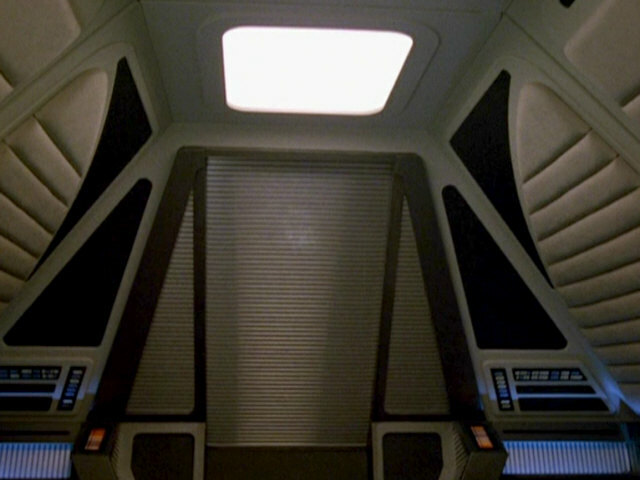 The large consoles on the left and on the right of the central column don't exhibit the indentation directly left and right of the column any longer, in which a horizontal console is located. Instead, there is a continuous console on the left and on the right that is slightly curved. 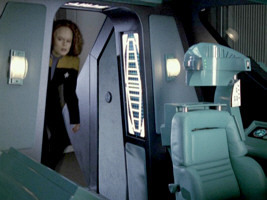 Janeway's shuttle interior in VOY: "Endgame"
The next appearance of the cockpit set is as the cockpit of the Enolian prison transport in "Canamar". 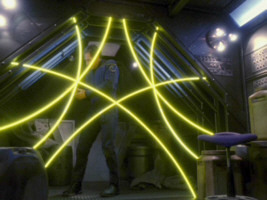 Here, further modifications to the set were carried out. 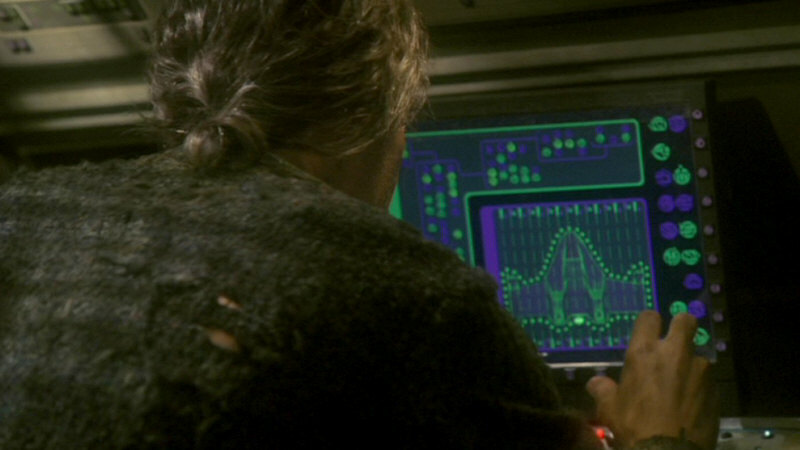 We can make out some remnants of the SC-4 modifications. 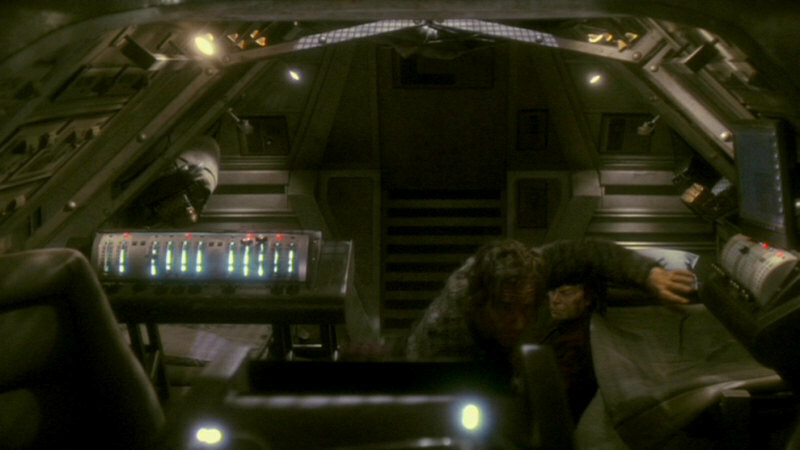 The Enolian cockpit too has a non-animated smaller console and a somewhat larger monitor below, just as in the SC-4 shuttle. 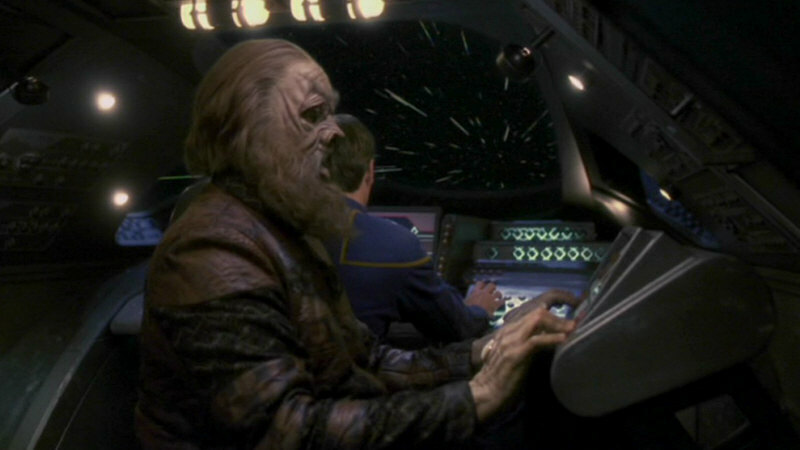 Just as the later Tellarite cockpit, the Enolian version comes with overall more push buttons (reflecting an older technology). 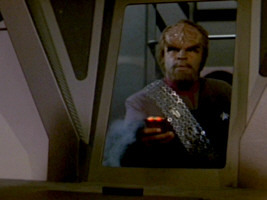 The roughly triangular cockpit window was considerably reduced in size for the Enolian set and hence matches the outside of the ship. 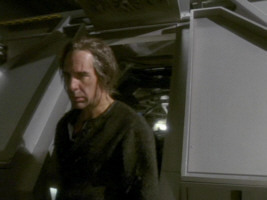 Enolian prison transport exterior in ENT: "Canamar"
Enolian prison transport interior in ENT: "Canamar"
In "Canamar", on the other hand, it was no option to use the aft section of Type 9. 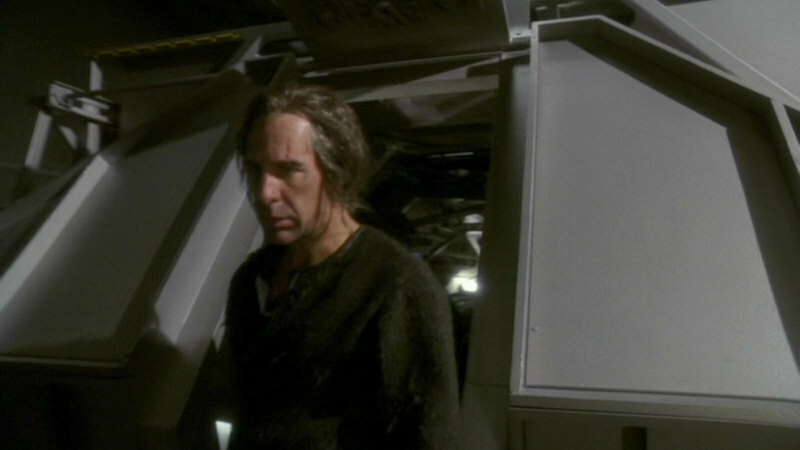 The large prisoner section had to be built as a new set. 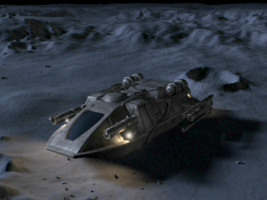 The exterior of Skalaar's Tellarite shuttle in "Bounty" (both the mock-up and the CGI) is based on the eponymous shuttle from the Voyager episode "Alice". 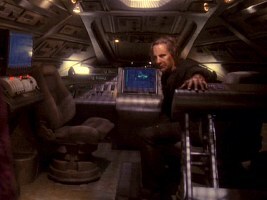 The cockpit of Alice bears a resemblance to that of the Type-9 shuttle, especially as the rear entrance hatch is concerned. Still, is is newly built set. 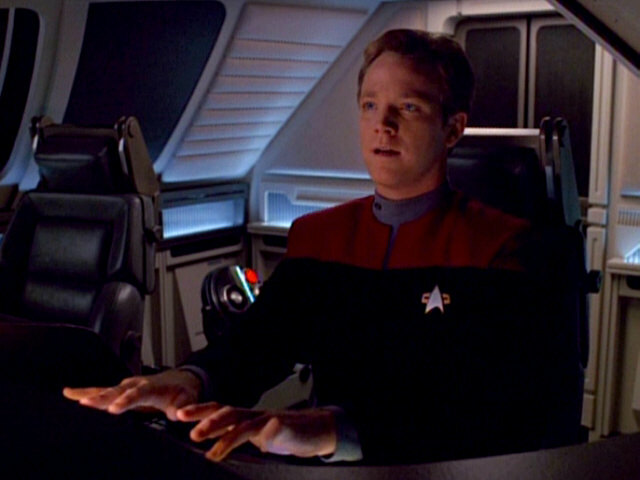 The cockpit of Skalaar's shuttle, on the other hand, is based on the Type-9 Starfleet shuttle. Unrelated Alice interior in VOY: "Alice"
Tellarite shuttle interior in ENT: "Bounty"
Curiously, the Tellarite shuttle set includes two small lateral windows that are smaller than on the Type 9 but that don't exist on the Tellarite shuttle CGI. 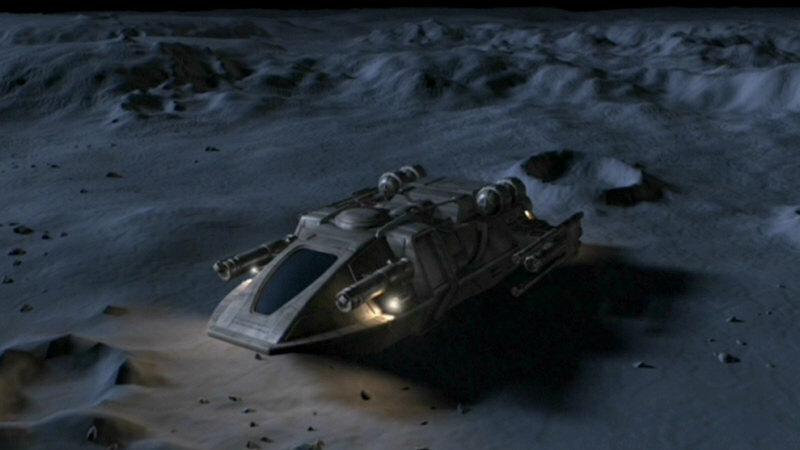 Comparing the central cockpit column of the SC-4 and Enolian cockpits with the one of the Tellarite shuttle, we can notice that it was made smaller yet again. 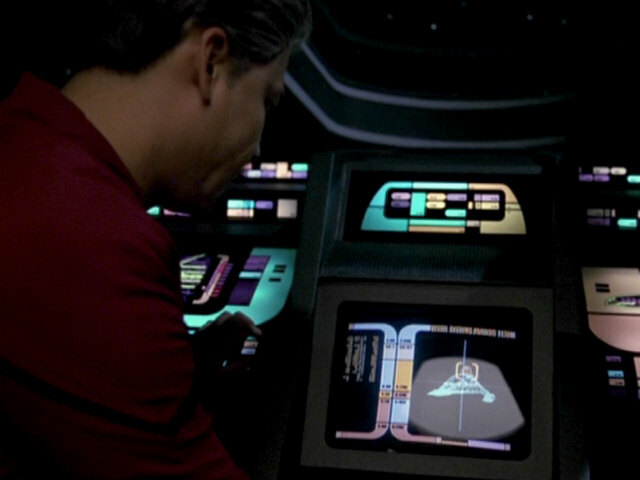 It does not have the small non-animated LCARS display any longer but a monitor already relatively far on top. 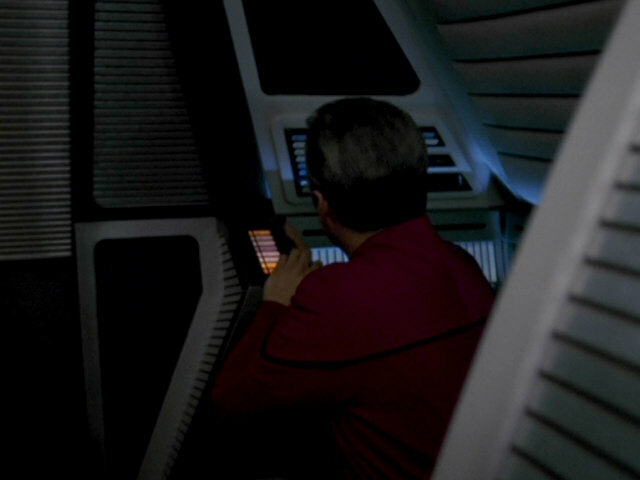 Furthermore the whole column was shortened and is now not longer than the rest of two forward facing consoles. 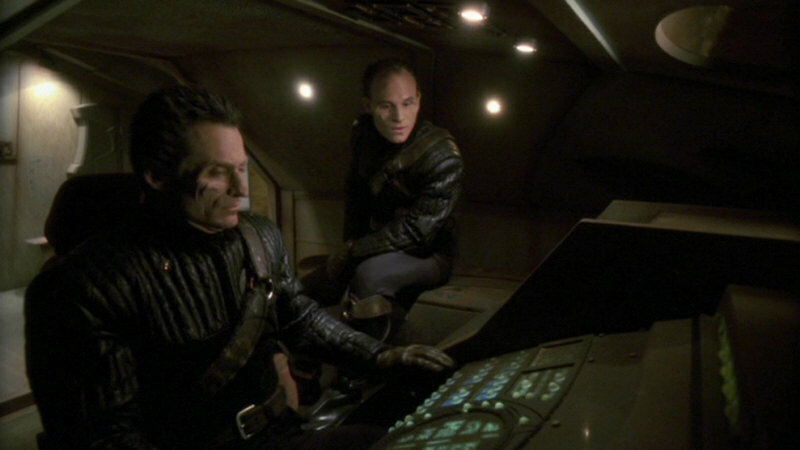 This has a simple reason: The cockpits of the Type-9 shuttle, of Janeway's shuttle and of the Enolian prison transport were two-seated, whereas Skalaar has only one seat. The central column that served to separate the seats of the pilot and the co-pilot needed to be cut down in size in order to allow the pilot to occupy a central seat. In the forward area of the cockpit there are also two lateral consoles that protrude into the cockpit. These consoles were not present in the previous appearances of the set. 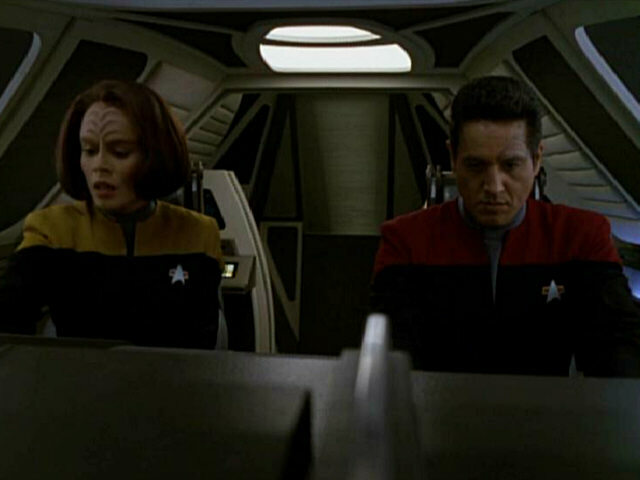 The middle part of the cockpit was constructed especially for this episode and seamlessly connects to the already existing part. 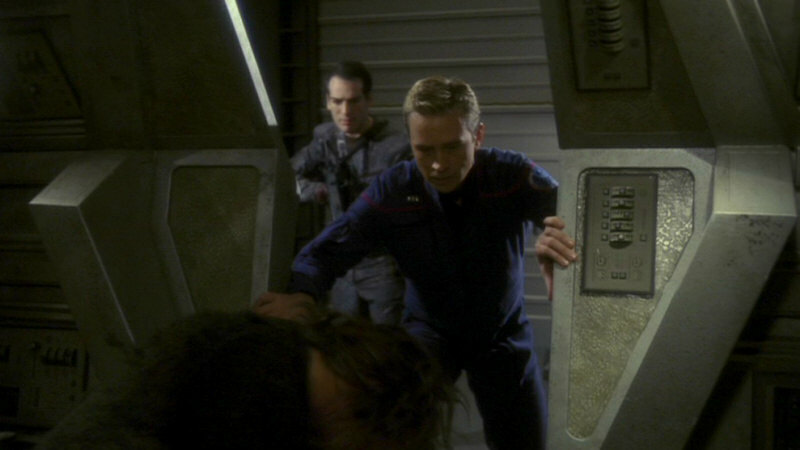 Only on the starboard side we can see a door. 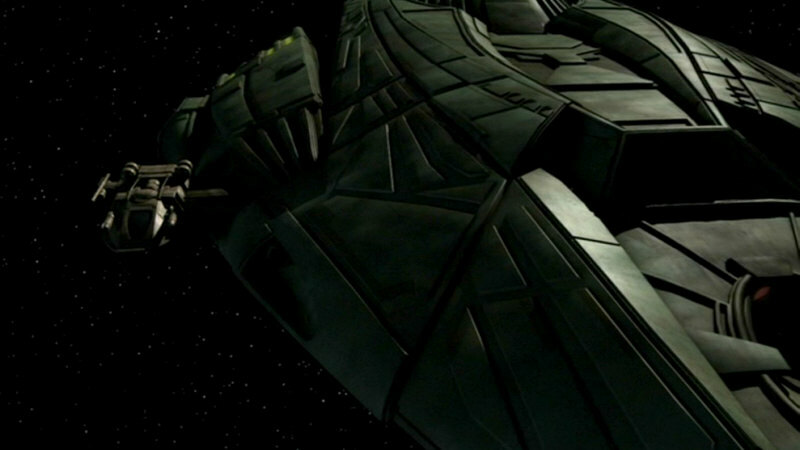 The opposite side does not seem to have a door, although we can see the port door on the CGI of the shuttle. 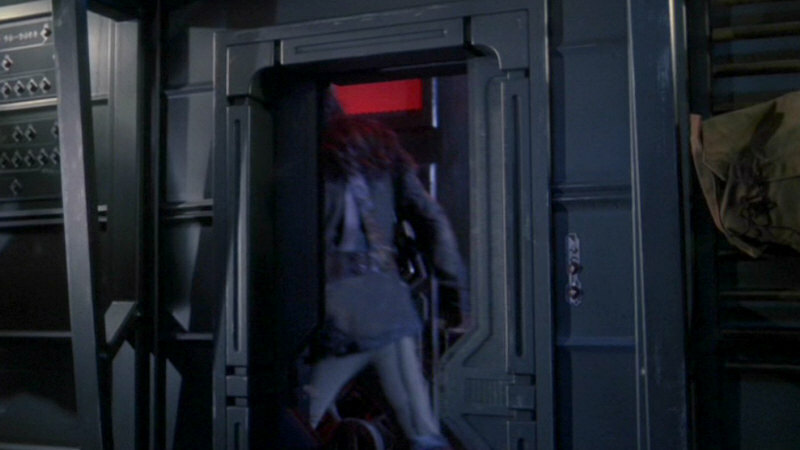 The shuttle even docks with the Klingon ship using the port hatch, as seen from the outside, while the Klingons enter the set through the starboard hatch. 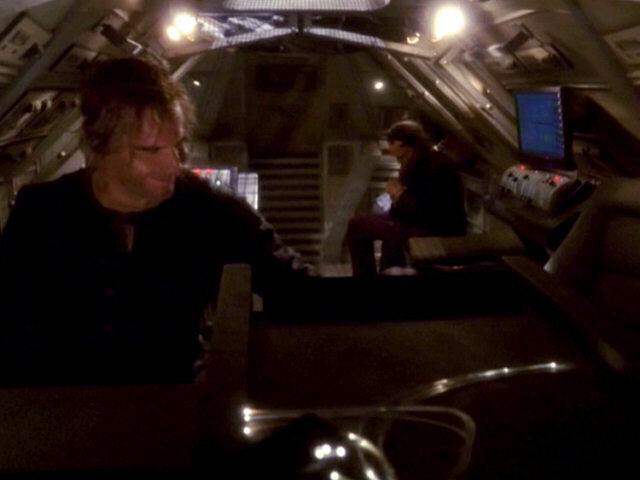 Tellarite shuttle exterior in ENT: "Bounty"
The aft part of the Tellarite shuttle set is interesting because it is another redress of the Type-9 shuttle. 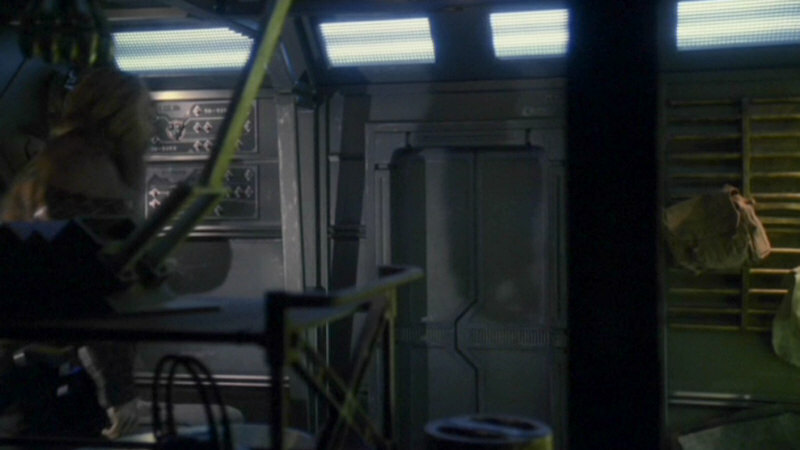 So it is clear that the Type-9 shuttle set was cut apart, and a new central part inserted to enlarge the set. 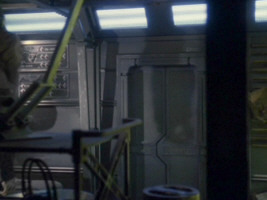 As the aft section of the Type-9 shuttle was similar to that of Alice anyway, especially concerning the opening mechanism of the hatch, that part of the Type-9 set was suited for the Alice-based Tellarite shuttle too. 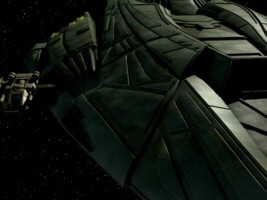 However, the aft hatch is not used in "Bounty" because some kind of "engine hood" is located here that can be seen from outside. 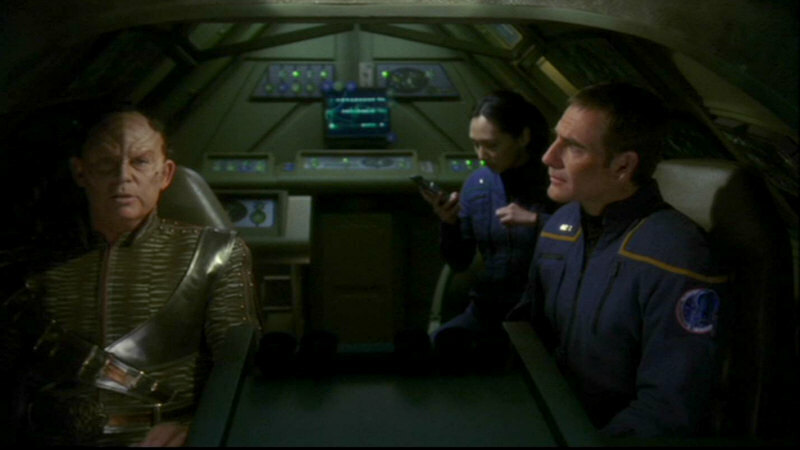 The life-size model of Alice and its CG version appeared in "Bounty" for the last time. 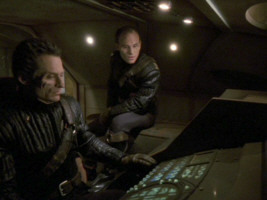 The large cabin built for the Tellarite ship in Bounty and based on the Type-9 shuttle, however, reappeared as the cockpit of the Malosian cargo ship in "Stratagem". 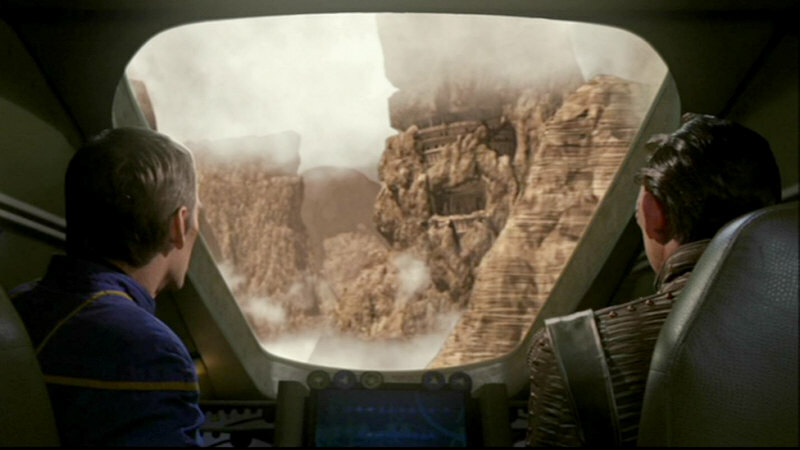 We can also see the Malosian set from the outside, which in this case is a set also in-universe, because the whole scenario is only a deception created by the Enterprise crew. Moreover, we are shown the "real" look of the shuttle on displays. 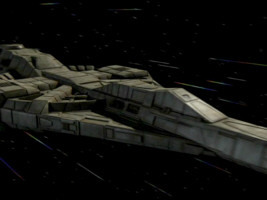 The look of this shuttle has rather few still in common with the Tellarite ship. 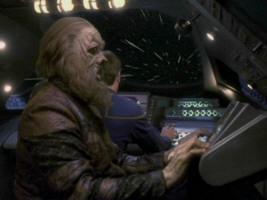 The forward area of the cockpit was slightly modified yet again. The large window was completely covered and all consoles were changed. The small windows are no longer recognizable. 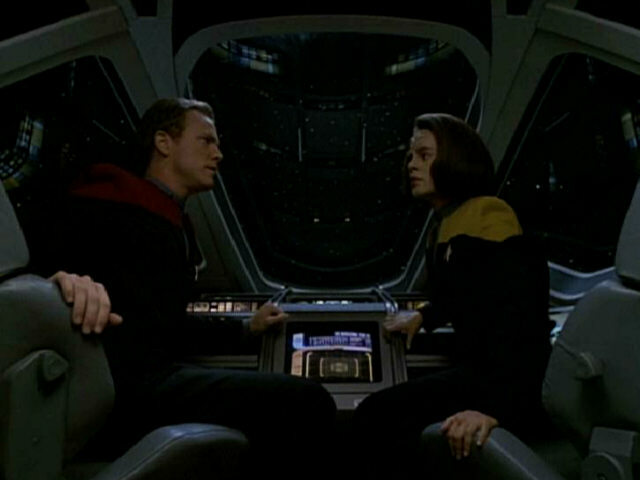 As this shuttle is two-seated again, a new protrusion of the central console was created. 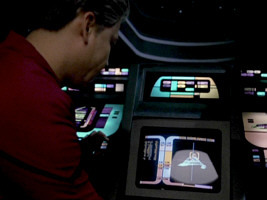 The lateral console on starboard is still the same orientation as on the Tellarite shuttle, whereas the port console was turned by 90 degrees. Simulator interior in ENT: "Stratagem"
There are some changes to the central part of the set that we don't investigate in detail. The starboard hatch now sports a window, outside of which there is a monitor that creates the impression that the shuttle is out in space. 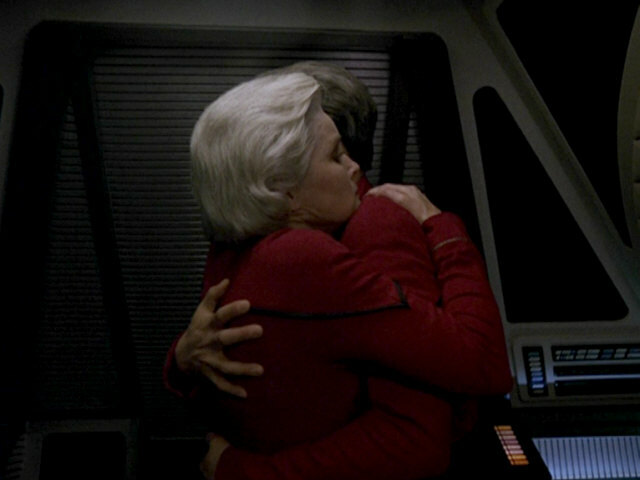 It is opened at one point in the episode. 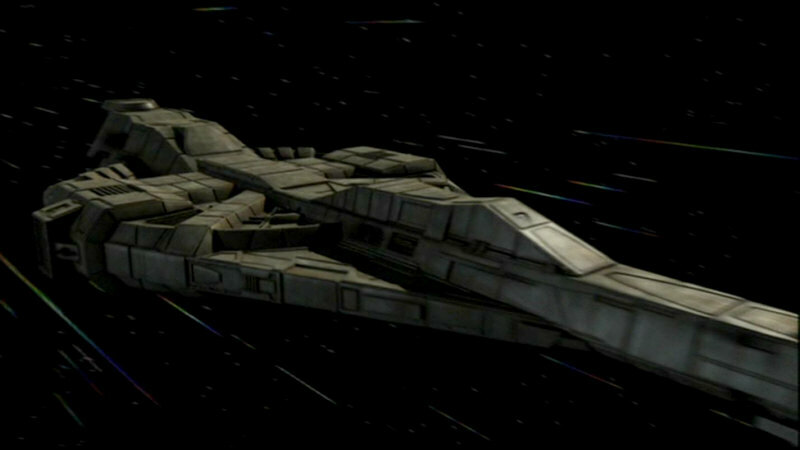 The aft part of the ship is still clearly recognizable as the aft part of the Type-9 shuttle. 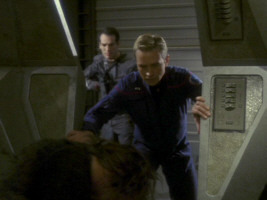 It is also noteworthy that after not using it in "Bounty" the aft hatch is opened again. 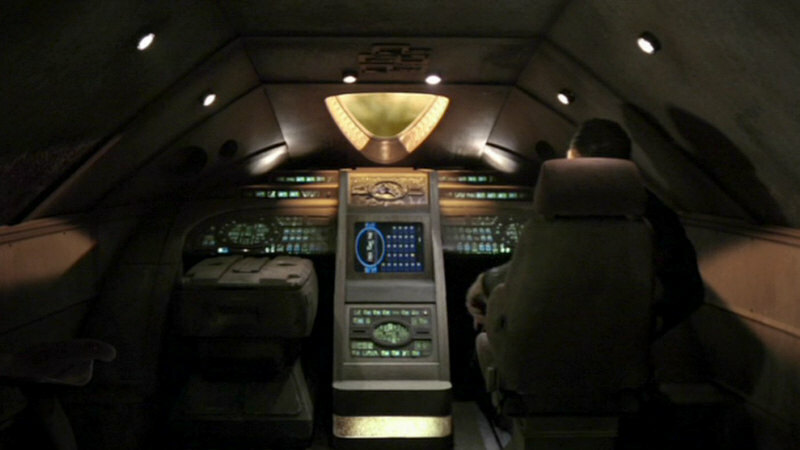 We get an impression of how the Malosian shuttle mock-up looks from outside (keeping in mind that it is just a mock-up also in-universe and does not have to match with a real shuttle). We can see that the mock-up is streamlined a bit like the Type-9 shuttle and has a characteristic aft section. 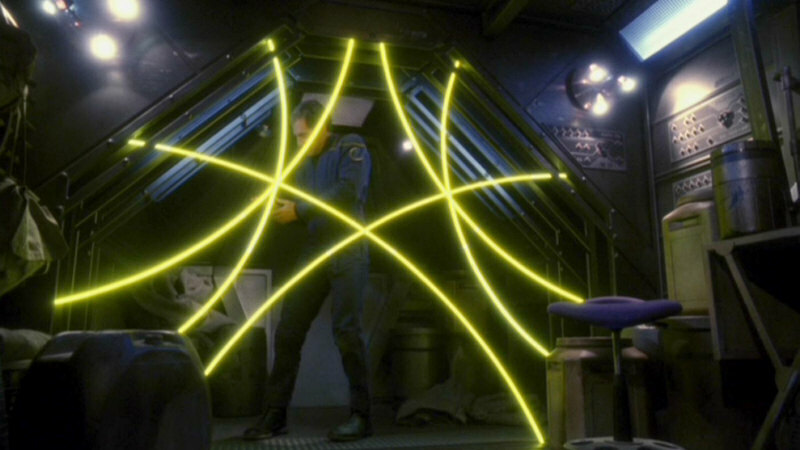 Simulator exterior in ENT: "Stratagem"
Malosian shuttle schematic in ENT: "Stratagem"
The schematics of the "real" Malosian shuttle have little in common with the Tellarite shuttle. 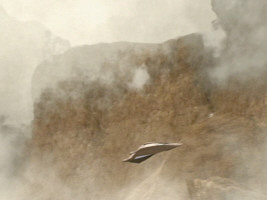 The wings of the Malosian version are a lot wider, and the outer engines are far apart from the main hull. 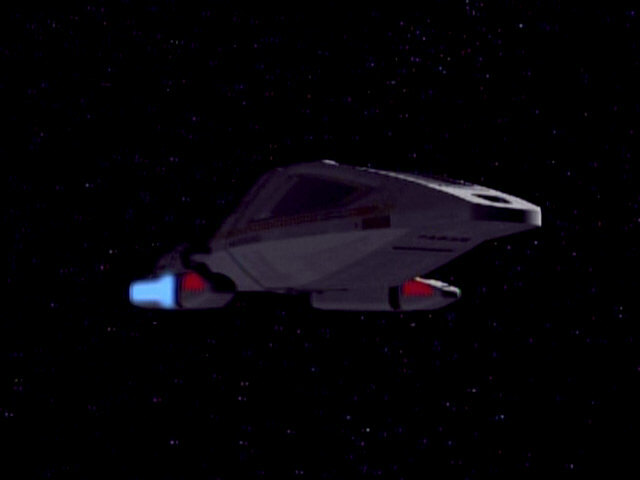 The whole ship appears very streamlined. 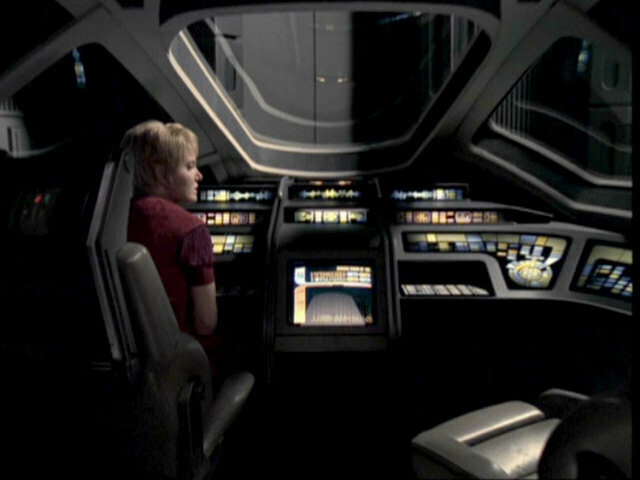 The size and proportions of the cockpit are still similar to those of Alice. Just as in the appearances of "Alice", there are two engines on the port and starboard aft of the ship. In place of the hatch, however, there is one additional fifth central engine. This is not consistent with the interior set that clearly has an aft hatch. 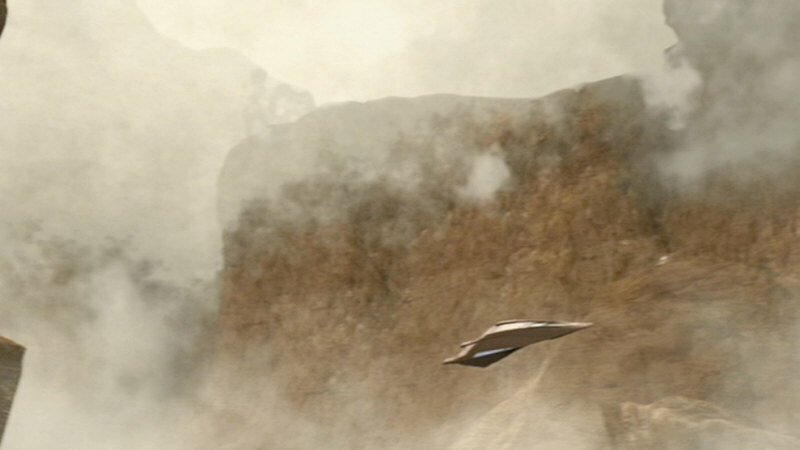 Because of the wing placement it is also hard to make out or to imagine where the lateral hatches may be located. So there are several discrepancies between the set that the Enterprise crew built and the graphic that is perhaps more closely based on a really existing Malosian ship. 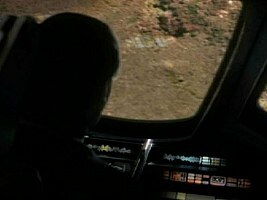 We can see the forward part of the Type-9 cockpit one last time in the Enterprise episode "The Council" in a Xindi shuttle ("Degra's shuttle"). The aft part is closed by a new wall so we can't recognize the familiar details of the Type 9 in this area with the characteristic door. 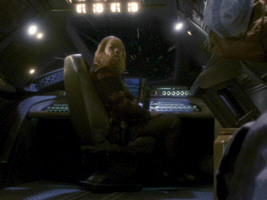 Xindi shuttle interior in ENT: "The Council"
The two consoles that were added for Skalaar's shuttle are still in place. 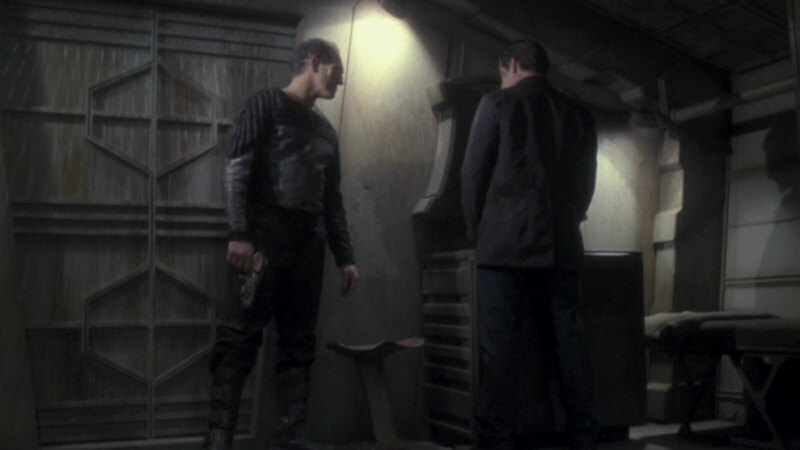 They still have the same configuration as in "Stratagem". 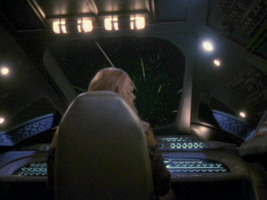 The big windshield was opened again after "Stratagem". 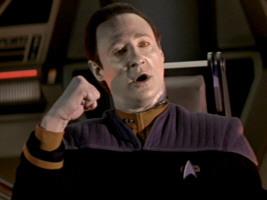 The consoles were "Xindified" style-wise but otherwise remain unchanged. 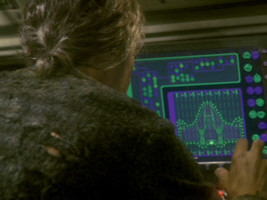 We can see a large monitor on top in the middle console. 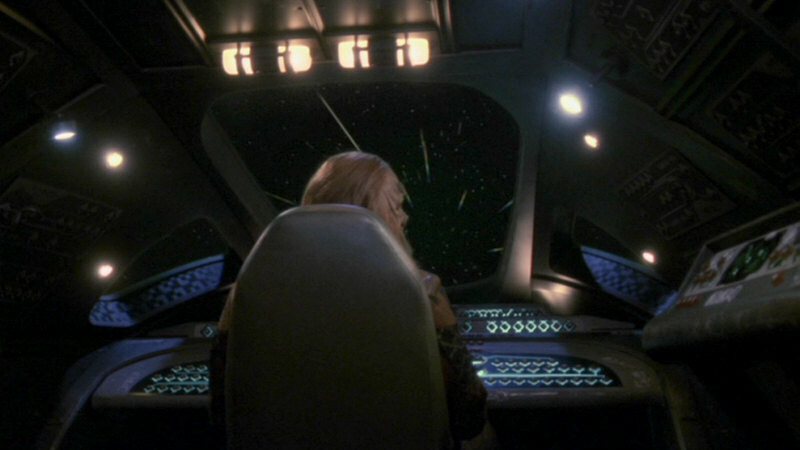 The exterior of the Xindi shuttle (a new CGI, not based on Alice) matches that configuration: a large window and a small aft area. 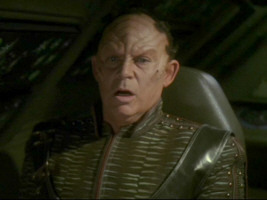 Xindi shuttle exterior in ENT: "The Council"
Thanks to Robert Heckadon for a hint about the re-use of the Type-9 shuttle cockpit in "Stratagem".